The whole fish looked particularly good at the grocery store this week. I was personally tempted to give some mirror-bright mackerel a try, but my mom only conceded the purchase of a lane snapper when the lady at the counter told her it didn’t taste too fishy. I knew right off the bat that I wanted to serve it over a bowl of fragrant seafood stock and a vegetable ragout highlighting shiitake mushrooms, sweet corn, and fresh black-eyed peas from our community garden. The only part of the equation that took me a while to figure out was the fish itself! I have cooked whole fish in parchment or foil packets in the past, steaming the delicate flesh with vegetables, aromatics, and flavorful liquids. I’ve also done a salt crust. 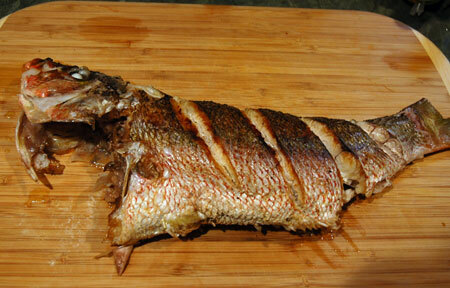 But I had never yet fried a whole fish, so I thought maybe this would be as good a time as any to give it a shot. The problem, as you can see above, was that our snapper turned out to be too long for the 12″ skillet. With that reproachful frown peeking out between the skillet and its lid, almost appearing to gasp for breath, it kind of felt like I was doing this gorgeous fish a disservice, but I had already committed myself so I saw it through. The fish came out cooked pretty well despite the cramped conditions, and the tail stayed cool enough to lend itself as a handle when it came time to remove from the oil and cut portions. I had scored the fish deeply before cooking, so serving was relatively straightforward, and I was able to avoid most of the bones. 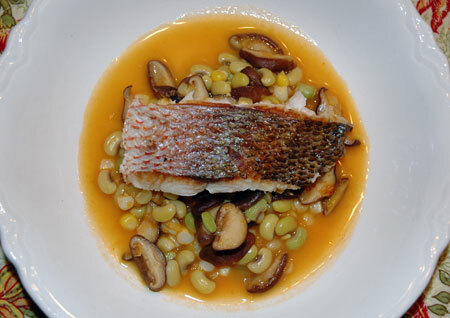 The finished dish: fried snapper over a mélange of sauteed shiitake mushrooms, scallions, sweet corn and fresh black-eyed peas, with a fragrant broth of saffron, ginger, and lemon. It was a lovely light combination of colors, textures, and flavors, an ideal celebration of summer’s bounty—the scallions were from our backyard and the black-eyed peas came from our community garden plots! The measurements here are generalized because I was playing it by ear, tasting and adjusting as I went. I made shrimp stock using some leftover shells I had saved in the the freezer for just such an occasion, simmered with water, onion, garlic, tomato paste, bay leaf, peppercorns, and kosher salt; I also threw in the shiitake stems as I prepped them. Melt the butter in a large skillet over medium high heat and add the mushrooms; saute until nicely browned, then add the ginger and scallions and continue to cook until fragrant. Add in the cowpeas, seafood stock, saffron and lemon; bring to a boil, then turn down the heat, cover, and allow to simmer until the cowpeas are tender to your preference. Add the corn in the last few minutes, and taste to adjust seasonings if necessary. When the vegetables are nearly ready, heat the oil in a large skillet or wok to a temperature of 325F. Prep the fish by rinsing off any stray scales, dry thoroughly inside and out, slash each fillet in several places until you feel the knife connect with bone, and season well inside and out with salt and pepper. 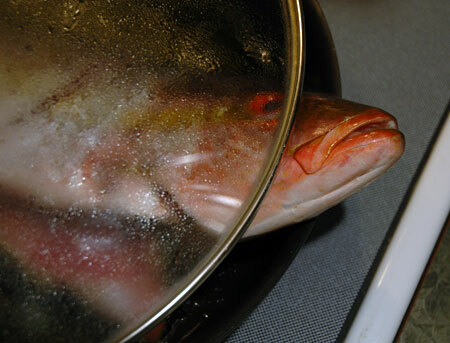 Carefully lower the fish into the hot oil and fry for about 4 minutes on each side, until cooked through and browning. Remove to a cutting board or serving tray and rest; using a fish turner, gently remove portions of fish and serve in a shallow bowl over a mound of corn mélange and stock.